Managing Television News provides a practical introduction to the television news producer, one of the most significant and influential roles in a newscast. Recognizing the need for formal training in this key role, authors B. William Silcock, Don Heider, and Mary T. Rogus have combined their expertise and experience to shape this essential resource on the responsibilities, demands, and rewards of the news producer position. Their book provides a strategic approach to producing newscasts and serves as an in-depth guide to creating quality, audience-friendly newscasts working within the realistic limitations of most newsrooms. It helps the student and the professional producer sort through the various deadline-driven challenges of creating a 30-minute newscast. 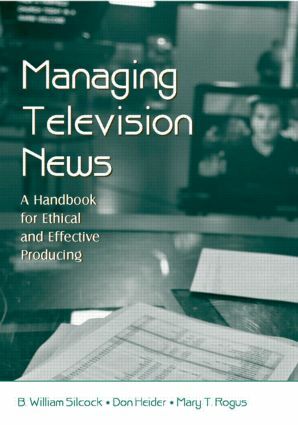 Filled with real-world examples and advice from news directors, producers, and anchors currently in the business, and photographs illustrating the varied perspectives in the position, Managing Television News provides critical skill sets to help resolve ethical dilemmas, as well as keen and fresh insights on how to win the ratings without compromising news quality. Career concerns are also addressed. This resource is a pioneering book for the professional television newsroom and the individual reader interested in starting or expanding a producing career. It is an excellent text for the college classroom, as its structure fits neatly into a semester schedule, and it is a must-have resource for both seasoned and novice producers, as well as students in broadcast news. Chaper 3. What Makes a Good Producer?